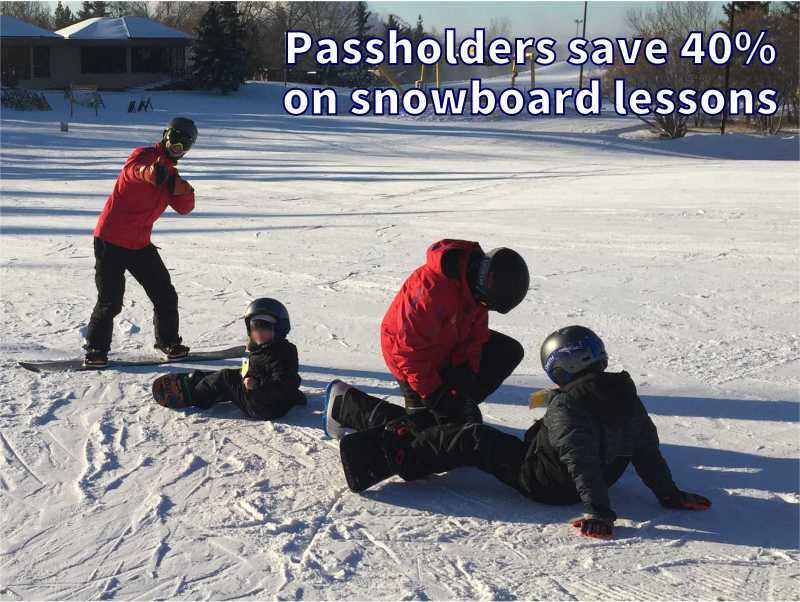 We have snowboard lessons for all ages and abilities throughout the winter. Click any of the red tabs for more information on the snowboard lesson groups that we offer. To register online for any session, just click on any of the blue tab lesson programs and then click on the lesson dates that fit your schedule. You are never too young to start snowboarding. Ridge Riders will introduce your child to the fun sport of snowboarding and is for children ages 5 and 6 years old. For children younger than 5 yrs, we recommend private lessons as one-on-one instruction works best with the little ones. We do have rentals available for some 3 year olds as our smallest snowboard boot is a size 9 and our smallest board is 80cm. Discover: If you've never snowboarded before, then our Discover program is the one to start out with. This program is designed to introduce you to the sport of snowboarding, get comfortable with the equipment and get you up and down on our Bunny Hill and Porcupine Hill. Green: This level is offered for those who have snowboarded before but are still more comfortable on our beginner hills.. By the end of the class, each student should be able to ride unassisted on our gentle Bunny Hill, Porcupine Hill and have been introduced to the intermediate runs. Blue: In this level, we perfect the novice turn and introduce you to the basic turn. By the end of a session, each boarder should be comfortable boarding our beginner and intermediate runs. Black: In the black level, our professional instructors will assist you in improving your basic turns and work on skills such as balance, pivoting, edge control and linked turns. Terrain park classes for ladies only are available starting in January or February. The classes are three Wednesdays in a row from 7:15pm to 8:45pm. Lift tickets for the day are included with the lesson program so come early and practice. Weekend snowboard lessons are offered every Saturday or Sunday for three weeks with classes available in the morning or afternoon. Note that the session that was originally starting on Feb. 2 or 3 has changed to start on Feb. 16 or 17 due to the very cold temperatures in February. The session originally starting on Feb. 23 or 24 has changed to a two lesson program starting on Mar. 9 or 10. Weeknight snowboard lessons are offered on Tuesdays or Thursday for three weeks. If you've never snowboarded before and our three-day lesson program doesn't fit your schedule, you can choose to take a one-day Discover Level group lesson. Discover classes for Juniors or Youth/Adults are one-and-a-half hours (11:45am to 1:15pm) and are offered on Saturday and Sunday as well as through the holidays. Note that the lift ticket for this class is a Bunny Hill ticket only.